718 pages | 8 Color Illus. | 296 B/W Illus. 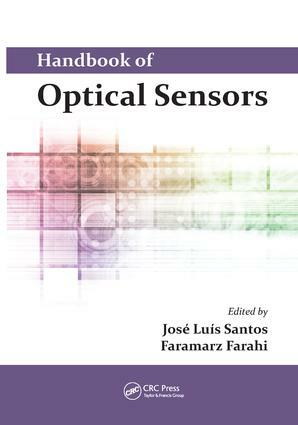 Handbook of Optical Sensors is an ideal resource for practitioners and those seeking optical solutions for their specific needs, as well as for students and investigators who are the intellectual driving force of optical sensing. "… an extremely useful reference source for optical sensor designers and for those who apply these types of sensors." "… a modern, comprehensive overview of optical sensors. … any practitioner wishing to make, improve, or simplify a sensor or its application would do well to consult this text." "… a valuable resource tool for both researchers and industrialists alike seeking to update their knowledge and understanding of the principles behind optical sensing and the diversity of fibre optic sensor systems. It further serves to highlight the potential of optical sensing technology to meet the ever-increasing needs of society for monitoring and control in diverse areas ranging from medical applications to environmental monitoring and industrial process control." "… an excellent introduction for young scientists beginning research in the rapidly growing field of modern optics and its applications. … also of great value to current workers in optics as it will become a major reference in the subject." "… very useful … It will be of great benefit to students and researchers in this field." "This book … can be understood and enjoyed by anyone with a background in physics or engineering, such as an undergraduate student. I would recommend it as a reference for the libraries of many scientists, engineers, and technicians in all fields." "… provides a comprehensive and integrated view of optical sensors, addressing the fundamentals, structures, technologies, applications, and future perspectives. … The 28 authors of these chapters are recognised experts in their areas of research and are major contributors to this field. Therefore, the book offers a broad perspective of the field and identifies trends that could shape the future, such as metamaterials and entangled quantum states of light. This is an ideal resource for practitioners and those seeking optical solutions for their specific needs, as well as for students, researchers, engineers, and technicians in all these fields." José Luís Santos earned his licenciatura in physics and Ph.D from the University of Porto, Portugal, benefiting from a collaboration with the University of Kent at Canterbury, UK. He is currently a professor of physics in the Physics and Astronomy Department of the Faculty of Sciences of the University of Porto. He is also a researcher with the INESC TEC-Centre for Applied Photonics (formerly INESC Porto—Optoelectronics and Electronic Systems Unit). His main area of research is optical fiber sensing, with a focus on interferometric- and wavelength-encoded devices. He has authored/coauthored over 200 scientific articles and coauthored 5 patents.